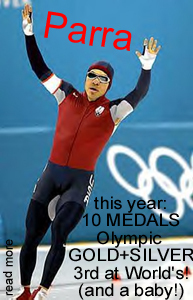 In 1984 Derek began roller skating and by 1996 he had become the most decorated athlete in the history of the sport. 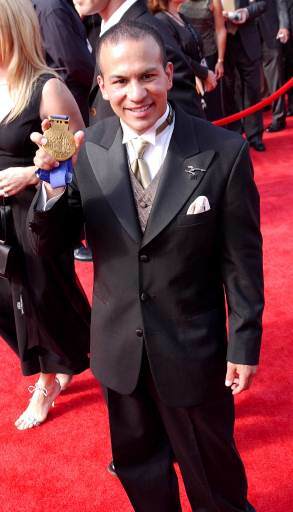 As an inliner he was a three-time national champion, two-time overall World Champion, two-time World record holder (1500m and 42K) and earned eighteen individual gold medals. 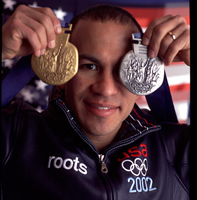 He was the most decorated athlete at 1995 Pan-Am Games winning 5 gold, 2 silver and a bronze medal. He had everything but an Olympic Medal. 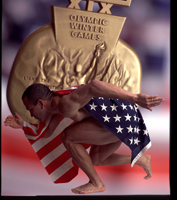 So in 1996, he switched from inlines to ice skates to chase after that medal. 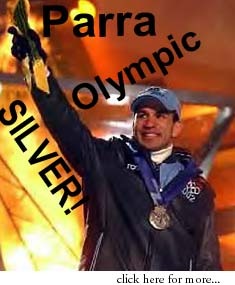 Just two years later he earned a spot on the 1998 US Olympic Team. 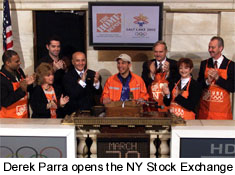 In February of 2001 he won a silver medal at the World Single Distance Championships (1500 meters) setting a new American Record and marking himself as "one to watch at the 2002 Olympic Games". 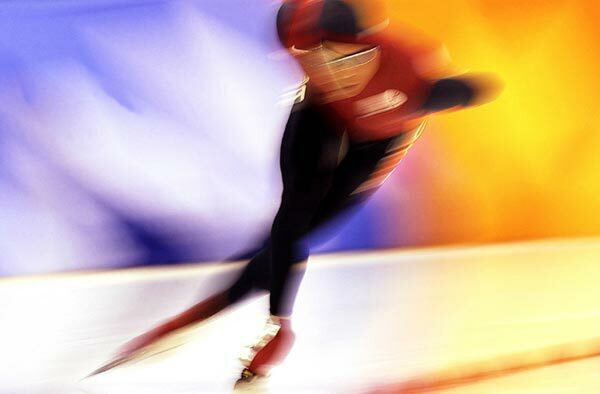 Later that year, in November, he won a gold medal at the World Cup competition in Den Hague, Netherlands and became one of America's foremost medal contenders heading into the Olympics. In Salt Lake City he did not disappoint! After being selected to carry the World Trade Center flag into the opening ceremonies, the emotional evening inspired Derek through a remarkable 5000 meter performance on opening day of the Games. He briefly held the world record en route to a silver medal finish. 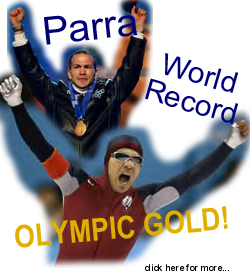 That set the stage for a stunning world record finish and Olympic Gold Medal in the 1500 meter event! Hobbies:Golf, basketball, tennis, volleyball...any and every sport that gets your friends together for some fun. Other:Credits his success to the fact that he actually enjoys training. Considers his "beating the odds" and getting to where he is today as greatest accomplishment...it is a "far cry from Southern California," says Parra...in addition lists friendships made while competing a great accomplishment...strongest influence is family, friends, and faith...enjoys many types of music, movies, and books...favorite food is Italian/Mexican...loves talking with others and teaching...always eats a pack of Fig Newtons the night before the race.